I assist people re-entering the workforce from a variety of life situations. Regardless of the situation particulars there's usually a lack of planning associated with it. Planning seems to be something most of us find vexing. There doesn't need to be a situation present for there to be difficulties with planning - but if there is, it only adds complications. Which begs the chicken and egg question, is it the lack of planning that causes the situation or the situation that makes planning so difficult? It hardly matters. The fact is that planning could help. Here's one way you can use it. Imagine a big check mark representing 5 years. The first part (the downward slash) constitutes 1 year. The rest (the longer upward pointing handle) represents 4 years. I call this the Re-Entry Check Mark ©. It's part of a process by the same name, Re-Entry Check Mark Planning ©. The goal in using it is to connect the entry point (achieving your job search objective) with your 5 year goals (vocational and life). The Re-Entry Check Mark can be used in either direction. Start at the entry point and work toward the end or start at the end and work back to the beginning. The concept isn't complex yet using this technique can be very illustrative. The importance of your Job Search Objective becomes obvious when you start on the left preparing to move right. Achievement of your objective is your entry point. In order to move forward effectively and efficiently you need to begin at the true beginning, which is to say, the right objective for you. Enter the 5 year continuum incorrectly (the wrong objective) and you'll find yourself starting over, wasting time and resources. 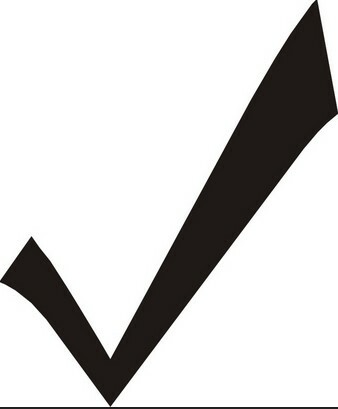 Each point along the check mark is connected to the next. Knowledge and experience gained at one point are used and built upon progressively. The same is true for contacts and connections. They multiply and intertwine month after month as you progress toward your 5 year goals. On the other hand, working the planning process in reverse order can be just as helpful. In order to reach the big goals certain things need to take place one step below. Repeating this and notating the required steps produces a series of prerequisite to-dos. Work this all the way back to the end of the first year. Viewed in terms of the Check Mark this is the bottom of the "V", a significant mile marker. The first year is a biggie. Progressing forward means (again, in terms of the Check Mark graphic) that you move downward before you begin to move upward. This isn't actually true, after all you are moving ahead in time, but you may not feel like it each and every day. Nonetheless be assured that you are making progress and staying on track is the name of the game. The first quarter of year one (months one - three) coincides with the typical probation period of most jobs. The goal here is to stay focused and make it through. The second and third quarters (months four - nine) combine to make the confirmation period, where you confirm all that you are from the point of hire through probation, making a concerted effort to provide service that exceeds expectations. The fourth quarter (months ten - twelve) you begin the recon period, where you actively start researching other opportunities as the Free Agent you in fact are. I'll have much more to say on each aspect of Re-Entry Check Mark Planning © going forward.